What’s So Special About Elliptical Machines? Elliptical machines are now present in most gyms and have been for some time. They are still considered one of the newer types of home exercise equipment – but home sales are now outstripping all others. They are a great, low-resistance way to burn calories and lose weight. What makes them so special? – read on. Elliptical trainers are particularly good for those looking to avoid the high-impact that treadmills and other gym equipment offer. The natural motion of an elliptical trainer means that they are much easier on the knee, ankle, and hip joints. This low impact exercise makes them very appealing to people of all ages and abilities – including those recovering from injury. upper and lower body at the same time. The arm poles, whose movement resembles skiing, are great for upper body exercises. Lastly, calves and hamstrings can be worked by pedaling the elliptical machine backwards as well as forwards – increasing your workout further. Those are just some basic benefits to these outstanding machines. Below are 7 more reasons elliptical machines are ideal for weight loss. Ellipticals can give a workout intensity to compare with any piece of gym equipment. Sure, if you are training for that half marathon, a treadmill might be better at preparing you for the high-impact workout of outdoor running, but ellipticals also get your heart rate where it needs to be. The better quality machines have resistance levels suitable for pro athlete workouts, so don’t underestimate the power. Depending on your fitness level and needs, you can adjust the incline and stride length as well as resistance levels. This is a one size fits all machine that will keep you fit and trim. Due to their range of workouts and the low impact factor they truly are suitable for all age groups and fitness levels. Most machines are super simple to use, and the interface is intuitive. 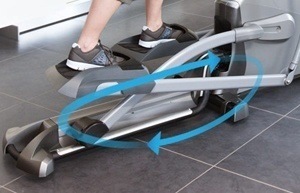 Even novice technology users can make an elliptical work to their benefit. The arm poles on elliptical machines offer a powerful upper body workout. This is something a treadmill sorely lacks. Users of ellipticals get a full-body exercise! Of course most have static handle bars as well – giving you more options for your workouts. Upper and lower body workouts combined mean more calories burned and less time spent exercising for the same results. Studies have shown that elliptical users have lower perceived exertion while working out. This means they don’t realize how hard they are working. This extends workout time much further than a jog around the track or on a treadmill. Don’t write this off as hype – serious studies have looked at this in detail and if you don’t believe it give one a try. 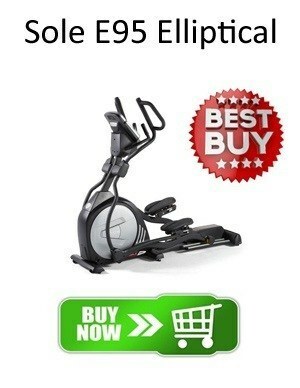 Ellipticals offer the best in high-tech workout equipment. Newer models are updated with impressive interfaces, entertainment features, and fitness tools. More and more, the industry is seeing ellipticals rising in popularity among users for these features, as well as the workout they provide. We can’t get away from it … Technology! These machines are, in general, easy on the body. People suffering from back and joint pain find they can have very satisfying cardio workouts when using an elliptical. With a wide variety of machines and preprogrammed workouts available you can choose your level of exercise from very gentle right up to extreme. Great for young and old – and even those in between. Because it works all parts of the body, the elliptical wins the award for most versatile and effective equipment in the gym. The range of motion coupled with the innovative programming features make it ideal for those looking for one machine to rule them all. Not convinced yet? Honestly, there are very good reasons why ellipticals are outselling treadmills, rowing machines and exercise bikes today. Versatility – one piece of modern, adaptable home gym equipment is all you really need these days. Add in the level of sophistication in programmed workouts … it is like having your own personal trainer. 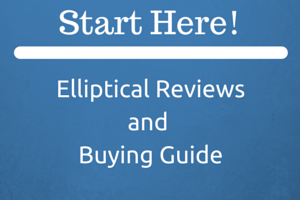 What are you waiting for – go read some of our elliptical reviews!